The 915MHz Hercules ISM Antenna is a high performance steel thread-mount ISM antenna for external use on vehicles and outdoor assets worldwide. Omni-directional high gain across all bands ensures constant reception and transmission. Durable UV resistant PC housing is resistant to vandalism and direct attack. At only 29 mm height it complies with the latest EU height restrictions directives for roof-mounted objects, with a diameter of 52 mm. Designed to not catch on tree-branches. 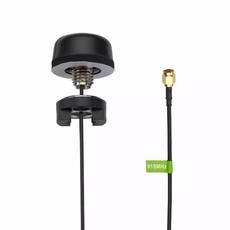 The antenna can be mounted on metal structures.